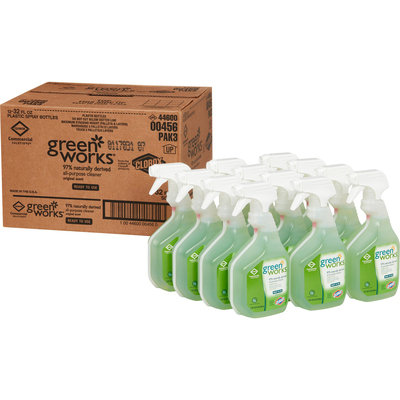 Green Works All-Purpose Cleaner Spray Combines Powerful Cleaning Performance With 98 Percent Naturally Derived And Plant-Based Ingredients To Safely Tackle Messes Throughout The Workplace. This All-Purpose Spray Cleaner Cuts Through Grease, Grime And Dirt With Ease Without Any Harsh Chemical Fumes Or Residue. It'S Suitable For Use On A Variety Of Surfaces Including Counters, Appliances, Stainless Steel, Sealed Granite, Chrome, Sinks And Toilets, Making It Ideal For Use In Commercial Kitchens, Schools, Offices, Daycare Centers And Other Business Facilities. From Clorox Commercial Solutions, This All-Purpose Cleaner Is Recognized By The U.S. Epa'S Safer Choice Program. With The Smart Tube Technology Bottle, You Can Spray This Cleaner Down To The Last Drop. 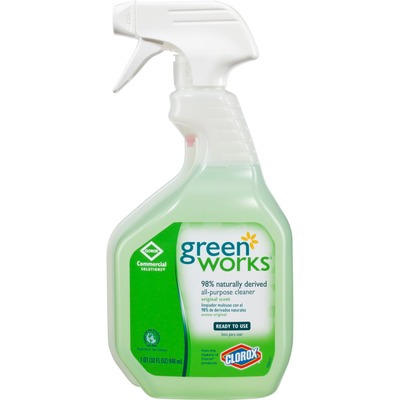 With Green Works Naturally Derived Cleaning Products, You Get Powerful Cleaning Done Naturally..
7930015552898 "Cleaner,Glass,Biorenewables 32 Oz Spray Bottle"
Green Works All-Purpose Cleaner Spray Combines Powerful Cleaning Performance With 98 Percent Naturally Derived And Plant-Based Ingredients To Safely Tackle Messes Throughout The Workplace. This All-Purpose Spray Cleaner Cuts Through Grease, Grime And Dirt With Ease Without Any Harsh Chemical Fumes Or Residue. It'S Suitable For Use On A Variety Of Surfaces Including Counters, Appliances, Stainless Steel, Sealed Granite, Chrome, Sinks And Toilets, Making It Ideal For Use In Commercial Kitchens, Schools, Offices, Daycare Centers And Other Business Facilities. From Clorox Commercial Solutions, This All-Purpose Cleaner Is Recognized By The U.S. Epa'S Safer Choice Program. With The Smart Tube Technology Bottle, You Can Spray This Cleaner Down To The Last Drop. With Green Works Naturally Derived Cleaning Products, You Get Powerful Cleaning Done Naturally.